All terraces retain magnificent top storey with parapet (although filled in on No. 32). Large two-storey Victorian house(s). Attractively restored although may have lost some detailing, eg., mouldings over downstairs French doors. Italianate style, about 1890. Basic Lshaped plan with bay windows on gable front, at both levels. Decorative cornices and mouldings on sills and above windows. Cast iron verandah and balcony posts. Both have lace fringes. Balcony balustrade also iron lace. Original verandah tiles and palisade fence. 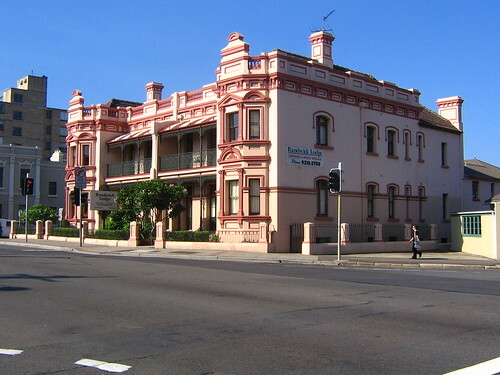 ‘Corona’ & ‘Hygeia’ Victorian Terraces, 211 Avoca Street Randwick, corner Mears Avenue and Belmore Road, Randwick. 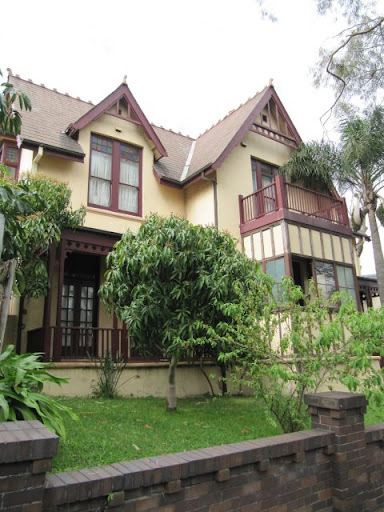 Large and picturesque late Victorian two storey stuccoed pair of houses with good cast iron verandahs. Excellent for townscape value. Heavily decorated balustraded roof parapets and Classically derived pediment decoration to window lintels. The houses retain tiled verandahs and front cast iron and masonry fences. All show some early examples of what would become Federation styles, such as verandahs with lace decoration, timber fretwork, raked roofs with terra cotta decoration, gablets, bay windows and tall chimneys. A large two-storey Victorian house in Queen Anne style. Attractively restored although may have lost some detailing, eg., mouldings over downstairs French doors. Built about 1890. Basic L-shaped plan with bay windows on gable front, at both levels. Decorative cornices and mouldings on sills and above windows. Balcony has bullnosed roof with bellcast roof over bay. Main roof is slate. Decorative barge boards with gable truss and finial. Similar style to No. 11, c. 1880. Spoiled by balcony enclosure. Features cast iron posts with brackets and frieze. Outstanding detailing on door and skylight above. Mouldings over door and around windows. Unusual feature is pointed gablet above balcony roof, located front centre. Huge stone Victorian mansion in Picturesque Gothic style. A very fine example of the style with some outstanding decoration. Large grounds, extensively planted, with stone retaining wall. Venice, 66 Frenchmans Road, Randwick is a rare and distinctive example of late Victorian Tudor architecture (also called Gothic Revival) retaining most of its period detailing intact. A grand, two-storey, transitional Victorian/Edwardian house with hints of Federation styles such as coloured and leadlight glass in windows, roof decoration etc. Highly individual design with both Gothic and Tudor influences evident. Symmetrical design with projecting gabled section in center. In 1889 Gee sold the residence of his lease for these 2 lots to Joseph Jonathon Dakin for the sum of 120 pounds an increase of 600% which indicates undoubtedly that Gee built this ‘gentlemans’ residence. The annual rent fixed by the Church of England remained at 13 pounds per year. Dakin was a builder from Randwick. A Permanent Conservation Order was made over the property on 15 May 1982 and it was transferred to the State Heritage Register on 2 April 1999.